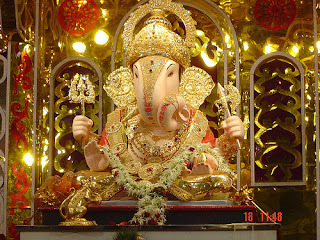 While we are away on our vacation, Pune will prepare to celebrate it's biggest festival, Ganesh Chaturthi. This annual Hindu celebration is dedicated to the elephant-headed God of auspicious beginnings, Ganesha (also known as Ganesh or Ganapati) and will keep the city festive much beyond the ten days of the festival. Note: Photo by HapPuppy. Many homes will install and worship clay idols of Ganesha during the ten days of the festival, after which the idols are taken out ceremoniously, carried in a procession through the streets of the town and immersed into the river. 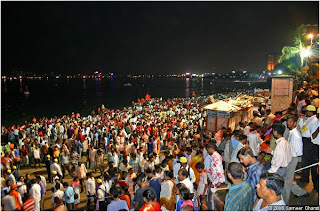 In Mumbai, the sea-front packed with people during the immersion ceremony, is a spectacular sight. The festival was apparently started by Shivaji, the great Maratha warrior and ruler, to promote culture and a feeling of nationalism amongst his subjects during the fight against the Mughal emperors. After his death the festival continued to be celebrated but on a smaller scale. In 1894 when the British banned public assemblies, Bal Gangadhar Tilak revived the state-wide celebrations as a way of spreading the freedom message through a legitimate religious festival . Fasting, feasting and distribution of sweets are important aspects of this festival. 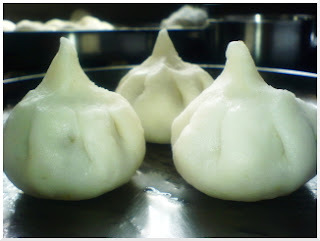 An ubiquitous sweet during this festival is the modak (shown here). These delectable delicacies are made up of a soft and fluffy rice flour cover that encloses sweet coconut filling and a particular favorite of the Lord Ganesha. The Dastarkhan, or the dining place where the food is served and eaten is normally a low chowki (table) with mattresses and bolsters that provide seating in the traditional Indian style. Traditional delicacies of Hyderabad that have been inherited from the Nizams are predominantly meat-based and cooked with a liberal use of exotic spices. Hyderabadi cuisine features key flavors of coconut, tamarind, peanuts and sesame seeds and sometimes even fresh fruit. 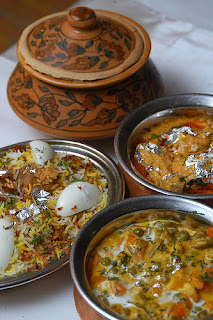 And so to celebrate my 100th blog post, let me serve some (virtual) biryani to readers! Note: Biryani picture by Vijay Pandey. Biryani is a fragrant rice dish made from a mixture of spices, long-grained Basmati rice, meat and yogurt. The name is derived from the Farsi word birian. Based on the name, and the cooking style (dum, explained later), it appears that the dish originated in Persia or Arabia. While some think it came from Persia via Afghanistan to north India, others think it was brought by the Arab traders via the Arabian Sea to Calicut, which had maritime trade with West Asia. Besides the historical facts, the biryani's story gets a bit spiced up with legends. One has it that Timor 'the Lame' brought it down from Kazakhstan via Afghanistan to north India. According to another fable, Mumtaz Mahal created this dish as a wholesome meal to feed the Mughal emperor's army. From the Mughals, the biryani spread to the Nizam's kitchens in Hyderabad, as it did to Awadh (now Lucknow) and Calcutta. 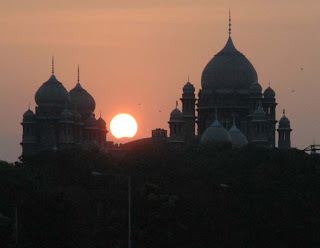 When Aurangzeb installed the Nawab of Arcot to oversee Aaru Kaadu region south of Hyderabad, he unwittingly led to the creation of the Arcot biryani. The biryani also spread to Mysore thanks to Tipu Sultan. Needless to say it was a royal dish of the nawabs and nizams. These worthies hired vegetarian Hindus as bookkeepers, which led to the creation of the tahiri biryani (a vegetarian version). Note: Biryani picture by Karan V.
To me 'authentic' biryani, and the one I crave the most, is the dum-pukht variety with Hyderabadi or Awadhi influence. Dum means steam and dum pukht literally means to choke off the steam. The food is placed in a pot, usually made of clay, and dough is used to create a tight seal to prevent steam from escaping. The food is slowly cooked in its own juices and steam, allowing herbs and spices to fully infuse the meat or rice, preserving the nutritional elements at the same time. In the best biryanis, grains of rice are well-cooked yet do not stick to one another. 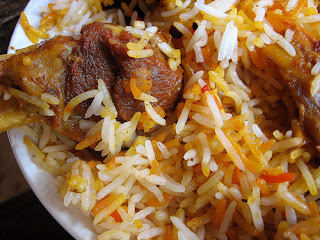 The meat, usually on the shank, is soft, well marinated and enhances the heady aroma of Basmati and the spices. I like my biryanis best with raita, onion rings and mint chutney. Hyderabadi biryani is traditionally made with uncooked, marinated lamb (kacche gosht). It is layered at the bottom of a pan with rice in various stages of 'doneness' -- the topmost is more pre-cooked than the rice nearest the meat which is only 25 percent cooked.The point is to have perfectly cooked meat with flavourful rice, preferably in the same dish, although there are some versions of biryani in which the two ingredients are browned and cooked separately. The Lucknowi biryani is made from stock, and not water. The meat is first sauteed and then cooked separately. The rice is later cooked in the same stock.This precludes the concept of Kachhe Ghosht ke biryani. Like someone described very aptly, while Hyderabadi biryani has top notes and middle notes, Lucknowi biryani owes its success to a homogenous blend of spices, so that no single one predominates. There is an interesting story to the biryani from Calcutta (or Kolkata as the city is known today). When cooks from the Nawab's kitchen fled to Kolkata in 1857, they arrived here with their biryani recipes which then evolved to create its own distinct identity. Kolkata biryani is far spicier than its other cousins, and distinguishes itself by its use of potatoes which absorbs the stock and spices during the cooking process. However, robustness rather than delicacy defines this biryani. 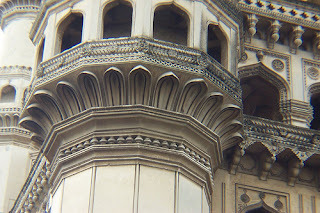 Note: Charminar, Hyderabad picture by Geetesh Bajaj. The fish and prawn Biryani which is unique to Kerala. In Tamil Nadu, you have the Ranipet Biryani and the Dindigul Curry Biryani (which was painstakingly prepared for President Bill Clinton when he visited India) from the Erode and Tirupur area. The Kangayam Catering College has documented and archived the Dindigul Biryani. "These varieties use a shorter grain of rice," he says. On the Western Coast, you have the Calicut Biryani and the Bhatkali Biryani, the recipe for which has come through the spice route and it has a Yemeni/Irani flavour. The North-West Frontier offers the Sindhi Biryani and the Kutchi Biryani, which is also called the Memoni Biryani. Kashmiris use asafoetida in Biryani, which is unique, and all the ingredients are marinated overnight. For those who wish to taste the best biryani in Delhi, I recommend Dum Pukht at The Maurya for a great experience. For those in Pune, Sigree is the best option. For the really adventurous foodie, there are many good restaurants and biryani shops located in the winding gullies (alleys) of Lucknow, Kolkata, Delhi and Hyderabad. Check with a local; you won't find these places listed anywhere else. Just before flying back to India, last week, I had a couple of drinks with a friend at Lago which is located in the hustle and bustle of Santa Monica's 3rd street Promanade. Locanda del Lago is an Italian restaurant with outdoor and indoor seating. 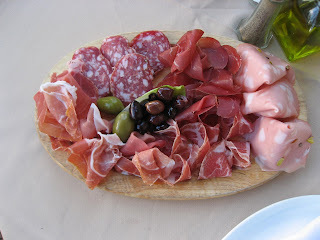 The Mojitos were among the best I have had, and the Italian cold cut platter of parma prosciutto, mortadella, salame, coppa and kalamata olives was great. This seems to be a good Italian restaurant worth trying out for dinner the next time. 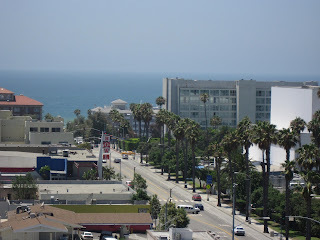 I stayed at the Sheraton Delfina Hotel on Pico Blvd this time. I liked the hotel with it's friendly staff and airy rooms. Here's a picture from my hotel window; you can see the Pacific Ocean in the distance. I spent an evening in Santa Monica last week with with a friend who I was meeting after a decade. We had worked together at Delhi a long time back. He has since moved to the US and recently made Beverly Hills his home. 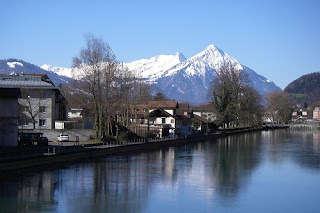 Having discovered that I blog about food, he wanted to take me to a place that was different from anything I have eaten before. We eventually settled on Ethiopian food (my first time!). Nyala is a family owned and operated Ethiopian restaurant that has been serving the Los Angeles area since 1988. Located in the Little Ethiopia area in Beverly Hills, this restaurant has since garnered considerable praise from many a local food critic. 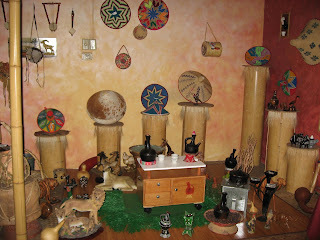 In the restaurant, a section for performing the traditional Ethiopian coffee ceremony is reserved in the back across from the bar, and large and small tables are set tastefully around tropical flowers. Traditional Ethiopian dishes such as Dora Wot (marinated chicken), Kifto (sauteed beef), and Kik Alecha (split peas with onion and garlic and ginger) are available. 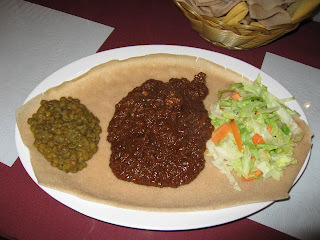 All dishes are served with injera, a spongy Ethiopian bread, vegetables and salad. 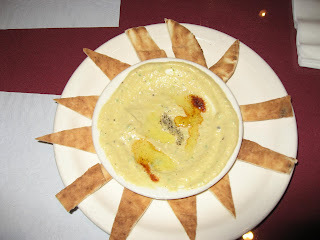 We were served an initial appetiser of what looked like bread sticks with hummus, but this one was spicier. I had ordered Yebeg Wot for my entree, which was lamb marinated in red wine and sauteed in seasoned butter, fresh onion, garlic, ginger, and seasoned red pepper sauce. A spongy, flat sourdough bread (called injera) is spread on the plate over which the rest of the food is served. You use your fingers to tear off pieces of the bread which soaks the gravy to eat. It is actually fun, and for Indians like eating dosa but with gravy! 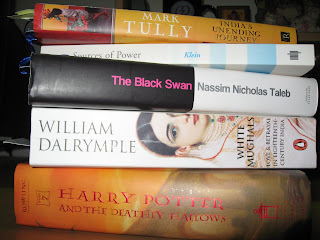 I recently completed reading White Mughals by William Dalrymple. 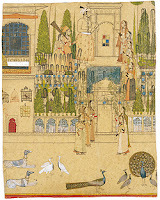 At its core is the improbable love story and marriage between James Kirkpatrick, the East India Company's Hyderabad resident at the end of the 18th century, and Khair Un-Nissa, the grand-daughter of a high ranking official at the court of the Nizam of Hyderabad. In spite of it’s imposing size, the book is a gripping documentation of the times and of history at its most appealing. The book provides new insight into a rarely discussed period of Indian history. And what a fascinating period in Indian history that was! This was a time when traders, soldiers, and artists from the western world came to visit, but stayed on. They stayed because the Indian princes paid them better, they stayed for the open culture that wasn’t prudish and embraced outsiders, but they also stayed because of the women! Many European officers during this time took up Indian wives and/or concubines. In fact, a third of all wills made by British officers during this period leave property and/or money to Indian women they left behind. Some Europeans during this time even became practicing Hindus and Muslims, in most cases influenced by the women in their lives. So many British officers and soldiers were ‘going native’ during this time, that England fresh from defeat at the hands of Americans (another population of British-gone-native!) decided drastic measures were called for. And so began a new regime of segregation that discouraged inter-marrying, barring children born of mixed marriages from jobs in the British Army, and discouraging officers from even wearing Indian clothes or using the hookah. The 18th century was also when the only source of diamonds in the known world were mined in Golconda. An era when soldiers frequently defected from the Portuguese, French and British armies to join those of the Indian princes. Both Tipu Sultan and the Maratha armies (two of the best during these times that won many a battle with the British and/or the powerful Mughal emperors of the north) were commandeered by Europeans. I was completely immersed in this fascinating book during my recent trans-Atlantic flight to the United States. Dalrymple’s other best selling books are the City of Djinns on Delhi and his latest, The Last Mughal, which covers the period of Bahadur Shah Zafar and the Indian Mutiny.